Born To Run is Bruce Springsteen’s epic, spiritual, meandering memoir, written over six years as a side project to his touring and songwriting. It starts at Bruce’s birth in Freehold, NJ in 1949 and ends in his mid 60s, exploring not only his musical career but also his relationships and his spiritual and emotional journey through life. Like many of Bruce’s songs, the writing in Born To Run is rich and poetic. Yes, I think the book could have been edited a bit. (But who wants to tell that to The Boss?) Yes, he repeats himself a lot. But the memoir also intensely personal and introspective, and his perspectives on his working class roots and the demons he’s battled throughout his life are quite moving. Bruce is a lot more insecure than one would think (I mean, he’s Bruce! ), and that insecurity fuels him. He says his 3 1/2 hour shows are because he feels like he has to prove something. He also has a big ego and manages the E Street band more like a autocracy than a democracy. He makes the decisions and the other musicians – as accomplished as they are – have to fall in line. He has dealt with depression throughout his adult life, including some crippling bouts in the last decade that left him paralyzed and unable to work. Patti Scialfa, his wife, is intensely private but more interesting (and patient!) than I realized. If you’re a fan of his music, Bruce talks a lot about his albums and what he was trying to accomplish on each of them, how/where they were recorded and how they fit into his overall musical evolution. He also spends a lot of time on his bandmates, including “The Big Man” Clarence Clemons, Steve Van Zandt and Nils Lofgren. There’s plenty of fodder for those who are well-acquainted with Bruce’s songs and the guys (and woman) he’s had on stage with him over the decades. The first third of the book is a little slow, as Bruce gets bogged down in endless details about early bands, gigs and roadtrips. I found that Born To Run picked up a fair amount when his career did. I listened to 2/3 of Born To Run on audio. It’s narrated by Bruce, which was a thrill. He infuses his narration with emotion and humor in his distinctive, raspy voice. Unfortunately, it was just too long to do the whole thing on audio, so I switched to print for the last third. Born To Run gave me a much better sense of the complexity behind this great showman. And I liked how, at the end, he expressed his hopes that reading his memoir would encourage others to take some time for the process of self-reflection. If you’re a Bruce fan or you like rock memoirs, pick this one up. Posted on January 26, 2018 by gayle. 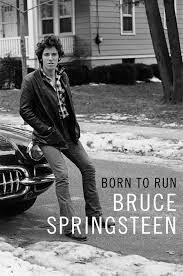 This entry was posted in Audiobooks, Memoir, Non-Fiction and tagged Born To Run, Bruce Springsteen. Bookmark the permalink. I have this book and hope to get to it soon.